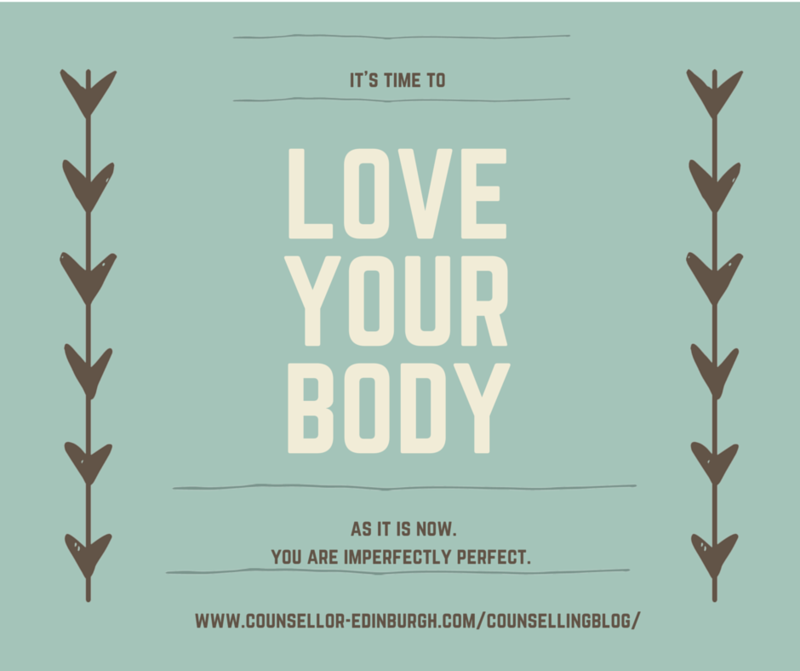 Edinburgh Counselling: Do you love your body? If not, I think it’s time. I’ve been aware of carrying a sense of waiting with me. It’s as though at some level I’m waiting for life to start. I knew that this is it; this is my life, but some part of me wouldn’t allow that knowledge to truly sink in. It’s strange the chatter in your head, which becomes so familiar. I was waiting until I was thinner and I had failed to notice the insidious nature of this repeated message. The thoughts have been keeping me living life in the shadows. So much of my own chatter is around not being accepted, and being found to be ugly. I am trying to love my body as it is. I am trying to stop waiting until I am “better”. It’s been amazing and painful too. I used to hope I could become perfect, because this would make me invulnerable. But I am vulnerable and I know that it’s this openness to the pains and joys of life which is real beauty. It’s the visceral openness which connects us. If you have thought for a lot of your life that you need to make up for how you are, by sacrificing your needs for others, if you sometimes feel shame when you meet the eyes of others, or if fear becomes lodged in your skin and you begin to hate it — I’d like to offer you a heartfelt alternative. I’d like to say to you: you are beautiful as you are. Not when you lose some weight or start to eat better. Now. I am beautiful and so are you. For so long I had hated my body, and the story is so typical because I was a healthy, fit and a melancholy sort of beautiful. But I punished my body because I didn’t know how else to deal with this sense that I did not fit, that I was wrong, built wrong, made wrong. I thought at times people could see ‘evil’ through my skin. I’ve come so far from that place now, but there was a hangover, something left over to shed. I’m bored of viewing my own beauty superficially; so here I make a pact to learn and to try to have a good relationship with my body, hopefully eventually to love it. I sometimes hate my stomach, there’s a bit of fat on it, and it doesn’t look as it ‘should’. But secretly I’ve liked it’s softness and the curve of it. I have begun to think about it from the inside too, it feels so much, it tells me my needs, it lets me know of my anxiety. It even feels anxiety in empathy with another. Surely this makes it beautiful. We tend to view ourselves in bits. Focus on our nose, dislike it; but do you do that to people you love? Beauty isn’t in the smile on a photo, it’s the experience of being with someone when they light up with laughter. Knowing that, letting that sink into my bones makes me feel brave. When I was at university someone said of her boyfriend “I didn’t used to like hairy bodies, but now I’m glad it keeps him warm” I loved the sentiment at the time. Try to find a part of yourself you bully and begin to think of it as part of your beautiful whole. Some of this can be a painful process, as with all change. If you have hated your body for a long time you have a familiar process of blaming it for feelings which are hard to bare and it can be hard to find a place for your distress. If you would like to change this process ask what support you might need, and go find it if you can, This might be finding a good therapist, a trusted friend, or online. Find a way to share and connect through your pain and move away from placing the distress into your skin. What we see as beautiful is nowhere close to what we experience when we feel beauty. Let it in. Beauty goes deep; and because of this, you are beautiful as you are. This entry was posted in Body Love, Wellbeing by admin. Bookmark the permalink. A beautiful article, Michelle. There is way too much rubbish out there telling us how we should look. We should put that rubbish where it belongs – in the bucket. And, as you say Let the beauty in. Hi Allie! I read the idea of comparing wobbly bits, or the curve of things to those curvy and wobbly things in nature. I kind of like looking at my stomach and thinking I would never look at a hill, and say it was too high, or wide. We are beautiful, it’s true.